BARBERVILLE, FL. (Thursday, Feb. 12, 2015) – Daryn Pittman recently gave one of his prized gator trophies to a friend whose battling an illness. His daughter demanded he get another and he did just that at Volusia Speedway Park Thursday. Pittman held off a charging Donnie Schatz the final four laps following a caution to score his nine career University of Northwestern Ohio All Star Circuit of Champions victory. Pittman’s victory was by .078 seconds. Schatz, who started 15th, had the crowd on their feet the final handful of laps as he continuously challenged for the win. “If you didn’t enjoy that don’t bother even coming back because that’s about as good as it gets,” said Pittman beside his Kasey Kahn/Mike Curb owned machine. “This is pretty special. I have a good buddy of mine back in Brownsburg, Indiana named Ben that’s battling some illness right now and I gave him the one gator that I had this winter. And my wife Mandy said ‘you know your daughter loves that, it’s a pretty special trophy…the first one you got here.’ I said ‘you know what I have five chances to come down here and win one of these.’ My daughter watched it on TV and she’s upset that she’s not here in victory lane. She recognizes this place as the gator race track. So this is going back to here,” added Pittman beside his Great Clips/Sage Fruit/Team ASE/Curb Records/Factory Kahne backed #9. “I have to thank my guys. Kale (Kahne)…I didn’t believe him…he kept telling me to run around the top down there (in turns one and two) and I’m thinking ‘I don’t know if that’s a good idea or not.’ Just stuck with it and I’m glad we stuck with our line and won it that way. Hats off to Donny (Schatz). He raced me clean. He could have definitely ate me up there on the back stretch,” concluded Pittman. “Hats off to the entire team, Giggles (Josh Heidcamp, Willie (Kahne) and Kolten (Gouse). This is a big win to get the year started off right. Schatz put on the show though from his 15th starting position in his Tony Stewart/Curb-Agajanian Motorsports, Bad Boy Buggies machine. “I have a great race team…these guys do a phenomenal job. It was a good enough race car to win, I just gave it everything I had…I just probably didn’t use up enough race track there. It’s fun to be able to race two wide and race clean and battle to the checkers and give the fans a great race,” said Schatz, the defending World of Outlaws champion. In the second third of the race it looked like Brad Sweet might power to the victory. But, the Grassvalley, California driver could not chase down his teammate and Schatz. “I probably burned my tire up there a little bit but I can’t really complain. It was a great race and a great race track. Daryn and Donnie had a pretty good battle up there…probably two of the best in the business,” said Sweet beside his Ollie’s Bargain Outlet/Avantage Health/Sage Fruit/Team ASE/Curb Records/Factory Kahne Shocks backed #49. “My guys are working really hard on we’re gaining on it. I really appreciate Mike Carber, Austin Wenrich, Red Cat (Rob Beattie), Ty Sipes and Justin Adams…we have a pretty good crew here. It was good to come out here and run good as we start our season tomorrow,” added Sweet. Pittman and Danny Lasoski would bring the field to green for the fifth UNOH All Star feature of 2015. Pittman would drive into the lead over Lasoski, Kerry Madsen, Lucas Wolfe, the previous night’s winner Greg Hodnett and Sweet. Lasoski would slip up the track on lap four allowing Madsen to drive into second as the leaders found the back of the pack by lap six. By lap 10 Pittman was in heavy lapped traffic as Sweet powered into second utilizing the extreme high line while Madsen, Lasoski and Hodnett gave chase. At the half-way point Sweet was closing rapidly on Pittman and drove around the leader to take the point as they crossed the start-finish line on lap 17. However, Pittman would drive the bottom grove in turns one and two to regain the lead. The first caution would fly on lap 22 with Pittman leading Sweet, Madsen, Lasoski, Hodnett and a closing Schatz who was working the bottom line to perfection. On the restart Schatz would drive under three cars to take third. Another caution would fly on lap 23 and the crowed was eagerly anticipating the restart to see if Schatz could take the lead. When the race resumed Schatz would blast under Sweet for second and drove right to the rear bumper of Pittman. But, the caution would fly on lap 25 for Wolfe who had a flat tire and would retire from the race. When the green flew again Pittman had his hands full with Schatz as Sweet and Madsen battled for third but Lasoski would experience problems and spin to bring out the final caution with just four laps to go. Pittman would not budge from his high line in turns one and two on the restart and Schatz pulled beside him. But, Pittman’s momentum would keep him in the lead. The lead duo would race nose to tail over the next three laps. When they exited turn four coming to the finish, Schatz gave it one final try and came up just a fraction of a second short. Behind Pittman, Schatz and Sweet were Hodnett, Madsen, Joey Saldana, David Gravel, Cody Darrah, Jason Sides and Terry McCarl. 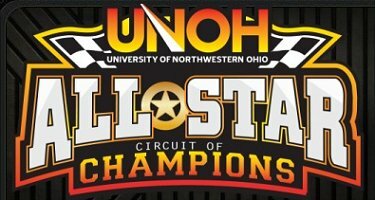 The New UNOH All Star Circuit of Champions will begin their battle for the $100,000 point fund on March 28 at Atomic Speedway in Chillicothe, Ohio.